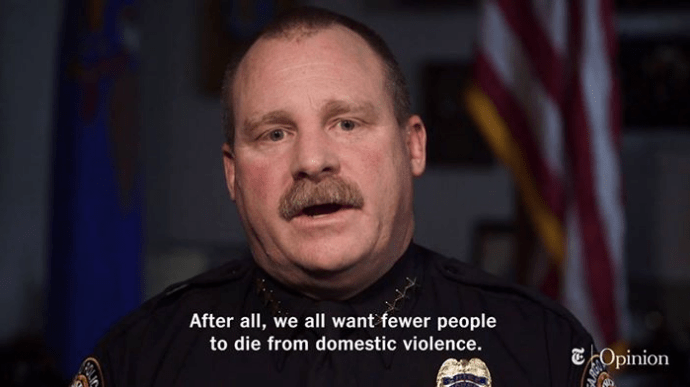 FARGO – Fargo Police Chief David Todd has entered the gun debate on the national stage. In a video on The New York Times’ website and Facebook page, Todd shares his views on gun rights and gun control, and discusses the death of officer Jason Moszer. “Even as a strong supporter of the Second Amendment, I have a red line. Individuals with violent records like domestic violence should never be allowed to own a gun,” Todd says in the video. Interspersed with Todd providing his views, The New York Times video plays images and police radio recordings from the night officer Moszer was shot after Moszer and other officers responded to a domestic violence call. “My biggest fear is losing one of my police officers,” Todd said in the video. “Statistically, these (domestic violence calls) are the most deadly calls we get, and the trend is rising,” he added. Todd states in the video that the man who shot Moszer was a convicted felon with a history of domestic violence and who was able to legally own a gun because 10 years had passed since his release from prison. According to Todd, federal laws have loopholes when it comes to domestic abusers and guns and he said only 17 states require anyone with a domestic violence restraining order to turn in their firearms. On the other hand, in 2017, eight governors from both parties ignored pressure from the gun lobby and closed some loopholes, Todd said in the video. “I understand criminals will always find ways to hurt people, but we can still take reasonable steps to prevent deadly acts by people who already have a violent record with firearms,” Todd said. “We all want fewer people to die from domestic violence and we want our police officers to go home at the end of their shift to be with their families,” he added. In an interview with WDAY, Todd said he agreed to record the video provided that it was done carefully. “I was not interested in being used as a pawn in a political agenda, so we worked through what my concerns were and I wanted it to be a common-sense message,” Todd said in the interview. The New York Times contacted Todd, knowing the 2016 shooting death of officer Moszer was still fresh in the minds of people in the community. “Gun ownership is a part of life here and that is a right we need to preserve, but there are common-sense things we need to look at when we have people convicted of violent crimes or domestic violence that perhaps they lose the right to own that gun,” Todd said in the video. Millions of New York Times readers saw Todd’s video, and many seemed to agree with his statement. “Watching comments, certainly more cynical outside our region, but the majority agree with what I am saying,” he told WDAY. Which domestic abusers will go on to commit murder? This one act offers a clue.